Our Masala Dabba Spice Boxes are a wonderful addition to your Indian pantry! These beautifully crafted, top-quality stainless steel containers are perfect for storing spices, both Indian and others. The Masala Dabba comes with a stainless steel rimmed and clear top, inner and outer lids, seven stainless steel bowls for holding your spices, and one stainless steel spoon. This sturdy and attractive spice box has been used throughout India for ages, and can now be a part of your ethnic collection. You can place any of your favorite spices in it, and have easy access for all your cooking needs. 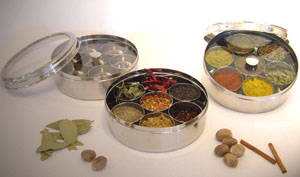 Holds all spices needed to prepare traditional Indian dishes and basic curries. The Masala Dabba measures 7 inches in diameter and is 3 inches tall; the perfect size for your counter or to place in a cupboard or a drawer.